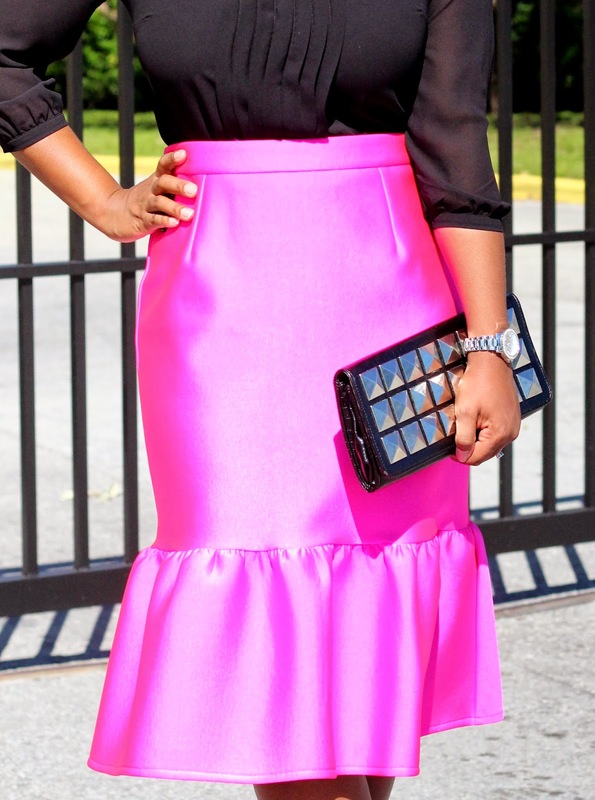 Hot pink midi trumpet skirt? Yes, please. Nearing the end of my pregnancy, and just after, I was feeling very lost in my closet. I did absolutely no shopping while I was pregnant. My maternity clothes were inherited, and I sent my husband to buy something decent that would fit me for our baby shower. (He did well, by the way.) So, re-learning my personal style and making it relevant after nine months of being out of the loop felt overwhelming. Finding this skirt instantly gave me the pick-me-up I needed to get motivated. I had to have it. While it's definitely not a skirt I could get away with wearing every other week, it's surprisingly versatile. I'm wearing it with black here, but it also goes well with white, dressed up with black and white printed blouses, or dressed down with worded or graphic tees. Typhanie for the win. Sound the trumpets. I love this skirt! Now I want one!! This hot pink ASOS skirt. *sigh* I got the memo late and it was either completely out of stock or no longer available in their smallest size. It's surprisingly so versatile (--> ha! typed this before I read your similar comment)! ooooooooooo I LOVE that skirt and it's in my favorite color!! Thanks! I didn't know your favorite color was pink!